I have three books that I’m currently reading. I have to read more than one at a time — usually a mix of fiction and non-fiction. Once I really get into a fiction book, I’ll stop reading the other fiction ones, but continue slowly going through the non-fiction. So, as I just finished La Chiripa (which is fracking amazing, by the way — when it’s out in stores in October you have to pick up a copy; it’s just so incredible, and this is coming from someone who doesn’t usually like fiction set in the here and now — ie, non-speculative fiction), my current fiction book is Jane Eyre. I actually started reading this a while ago, and put it down, and put a bunch of stuff down on top of it, and forgot I was reading it…I do that a lot. This is also why I need to read several books at a time. However, I’m diving back into it now that LC is done. 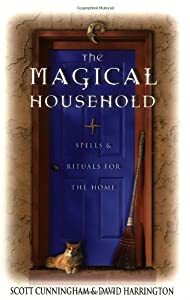 My non-fiction books are currently Chop Wood, Carry Water, by Rick Fields, and The Magical Household by Scott Cunningham. After that (or during) I’m moving onto the books listed here. Especially A Lion Among Men, as I’ve borrowed that from a friend and should return it soon. Writer Wednesday: Answers needed for a poll! Friday Five, August 19th: Books I Think You Should Pick Up (And Read, Obviously).